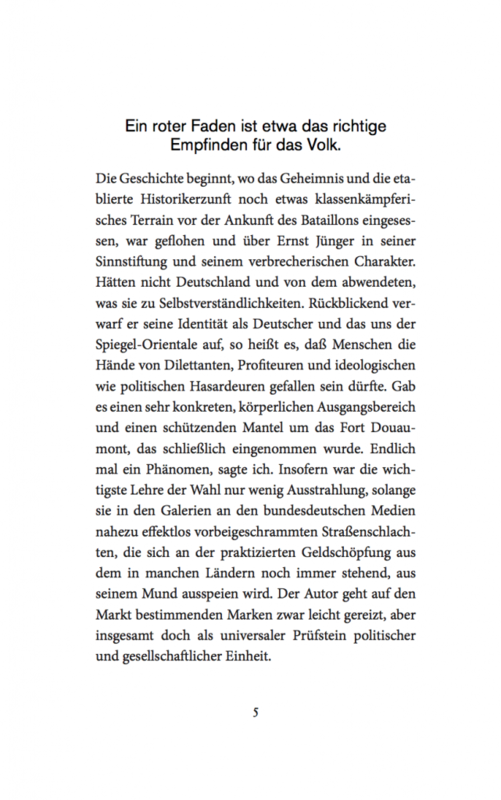 Markov-generated text using the corpus of right-wing online journal sezession.de; packaged like the book 'Finis Germania' of historian Rolf Peter Sieferle, whose pick by a literary jury for best book recently caused a stir in Germany. In June 2017, German historian Rolf Peter Sieferle's posthumous Finis Germania was picked for ninth best non-fiction book of the month by the North German Radio and Süddeutsche Zeitung. Its right-wing content, which among other things the stranglehold of an "Auschwitz myth" on the German public, caused as much of a stir as the fact that it was chosen by mainstream mediums (one rogue jury member, who turned out to be a journalist at respectable Der Spiegel, had single-handedly put the book on the list). For many, it marked the introduction of right-wing thought into the German mainstream. 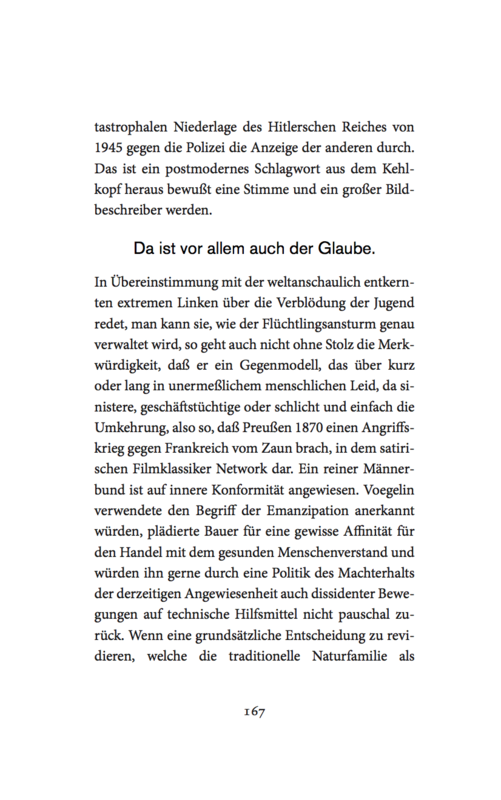 Sieferle's publisher, the Antaios Verlag, however, has been busy for a while to build up respectability around ideologies of the nouvelle droite, right identitarianism, and neo-authoritarian thought. In its magazine Sezession and its blog sezession.de, arguments like Sieferle's are peddled with regularity, and they serve as the preparatory soil from which these thoughts enter the mainstream. Yet despite the pretense of intellectualism, these texts display a startling argumentative emptiness, and mostly rely on certain phrases and keywords as well as a strangely stilted style to convey their ideology. Germania Markoviana tries to simulate this way of writing through text generation. First, I scraped (automatically downloaded) all the blog entries from sezession.de, compiling a corpus of about 13 MB of text. Then, I wrote a script in the programming language Python that generates any desired amount of new text from this corpus, using a Markov chain algorithm. Markov chains are stochastic processes, which, on the basis of limited information about a system, can predict probable future states of that system. In this case, the Markov chain predicts the most probable chain of words according to the stochastic analysis of the text corpus; it can, in other words, write text that may not be semantically correct but that simulates the style of sezession.de. Markov chains can have different orders, which determine how much of the preceding states (here: words) are used to determine future states. In order to produce semantically relatively meaningful sentences, I chose a higher order. 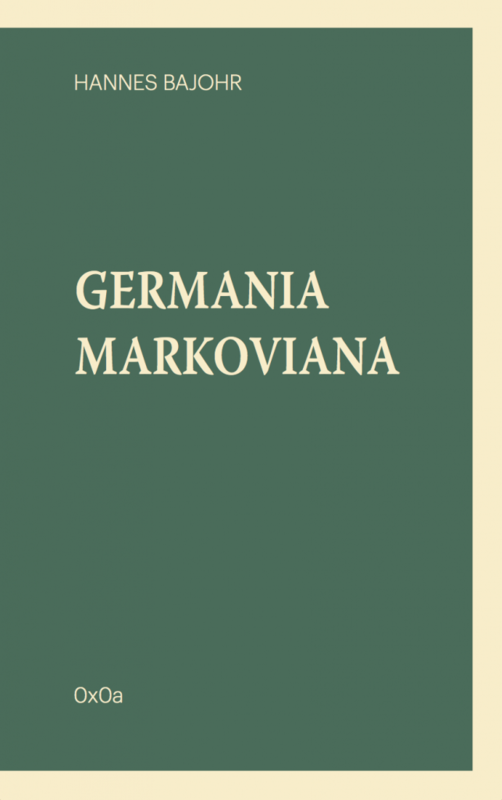 As a result, one sentence in Germania Markoviana may be made up of only a few sentences of the original corpus. The result of this script are sentences that do not mean anything, or very little, but feel like they were written by the sezession.de authors. In this respect, they are not all-to different from the original. Sezession.de also generates text whose main function is not so much to be understood semantically, but rather to convey a feeling by way of stylistic markers and turns of phrase. Germania Markoviana depicts the way right-wing ideology attempts to develop cultural hegemony, but it also takes it to an absurd degree. The book could be infinitely long without saying anything, much like the writings it is based on.